Back pain has many different causes and can occur at any stage in life. However, it is more common in people over the age of 40. For the greater part, back pain is due to wear-and-tear. This wear-and-tear is in most people due to e genetic tendency to weak cartilage. Cartilage is found in the moving components of the spine. The intervertebral disc and the facet joints. The disc is located between the bones (vertebrae) of the spine and act as shock absorbers. The joints (there are one on the left and one on the right) are located at the back of the vertebrae and join two adjacent vertebrae. Both the disc and the joints are prone to wear-and-tear. The disc is made up of a thick layer of fibers on the outside and a softer nucleus. The thick outer fibers are called the annulus fibrosis and the center is called the nucleus pulposus. Damage usually occurs to the outer layer and disruption of these fibers, allow the fluid contained within the nucleus pulposus to start leaking out. This will cause the disc to dehydrate and become weaker. It is frequently referred to as a ‘Black disc’ on MRI scan. The resulting inflammation and irritation in the damaged disc can lead to back pain. The disc is in close relation to the spinal nerves and as it weakens, it can flatten and bulge outwards and compress these nerves. This can lead to leg pain, known as Sciatica or radiculopathy. The joints, known as facet joints, can become irritated, inflamed and in the end will develop arthritis. This leads to mechanical back pain and referred pain. This is the term reserved for the pain caused by inflamed and arthritic joints and the pain is typically worse after a period of rest. Patients will typically report that they struggle to rise for a chair or get out of bed in the morning. The damage to the annulus fibrosis is usually called an annular tear and is demonstrated on a MRI scan. It can cause debilitating back pain. Progression of the weakness of the wall of the disc leads to progressive bulging of the nucleus through the annulus. As it progresses, more of the nucleus material will start to herniate or slip through the defect and is therefore call a slipped or herniated disc. Referred pain occurs when the structures adjacent and distant to the spine are affected by the inflammation in the spine. Adjacent structures would include the muscles and tendons of the spine and distant areas can be affected through spread of the inflammation along nerve roots to the pelvis, hips, groin and thighs of the affected person. When a disc presses on, or pinches a nerve, the person. Will experience pain in the area that the nerve usually covers. In the lower back, the nerves travel to the legs and a person will experience severe, frequently unremitting pain, in a certain area of their leg. This is the same area of the leg that the nerve root supplies. A facet block is performed to reduce mechanical back pain due to facet joint inflammation. It is performed under local anesthesia, conscious sedation or general anesthesia. The needle is introduced through the skin and guided by X-rays or a CT scan. It brings temporary reliëf for weeks to months and all the facet joints that are inflamed have to be treated. This procedure is performed for the same reason as the facet Block and gives longer lasting relief, usually one to two years. The basic technique is similar to a facet Block, except that a radiofrequency current is passed through the needle and disables the pain carrying capacity of the joint. The two primary forms of this procedure is a thermal and a pulsed procedure. In the thermal procedure, the tip of the needle heats UP as the radiofrequency current remains constant. In a thermal procedure the nerve is interrupted by the heat, but it grows back after a while. In the pulsed procedure, the current is pulsed and it disables the nerve by the electrical pulsations. The nerve is not interrupted by this procedure. Both procedures give temporary relief. Steroids can be injected through a needle into or next to the spinal canal to relieve inflammation associated with disc damage and nerve root irritation. It is also performed under local anesthesia, conscious sedation or general anesthetic. It is performed under X-Ray or Ct scan guidance. It gives temporary relief and is useful in relieving pain during the conservative management of back pain. A laminectomy is a surgical procedure performed under general anesthesia. The lamina is located at the back of the vertebrae and forms part of the roof of the spinal canal. Most spinal operations utilize a laminectomy to allow the surgeon access to the nerves. 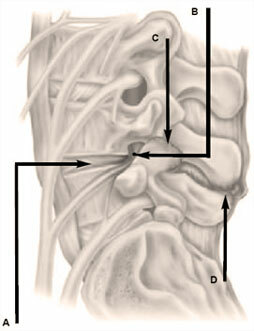 A. laminotomy is similar to a laminectomy, but less of the lamina is removed. A discectomy is performed when the disc is pressing on nerve roots. A. Laminotomy ot laminectomy is usually required to allow access to the disc. In most cases only the portion of the disc that is compressing or pinching the nerves, is removed. In larger fusion operations, the disc may be completely removed and replaced by a spacer. A fusion procedure is for the greater part performed with pedicle screws and rods connect the screws. The intention is to stop movement of a section of the spine in cases where patients have mechanical back pain with, or without, nerve root compression. The screws and the rods fix the spine, but the ultimate success of the operation depends on the vertebrae growing together and fusing. Bone or bone-like products are implanted during this procedure to aid the fusion process.